Promo shall run from November 15, 2018 – February 14, 2019. Only POS affiliated stations are included. Promo shall be for registered PVC/SDC users only. For cash and credit card transactions only. Fleet, Bulk and PO accounts are disqualified to join. For every 6 liters, single receipt purchase of any Petron fuel product, customer is entitled to one electronic raffle entry. To validate your entry, update your registration to include your complete address on the number written at the back of your PVC. There shall be 1 set of winners for Visayas and 1 set of winners for Mindanao. Winners of raffle entries from November 15, 2018 12:00 AM to December 27, 2018 11:59 PM shall be drawn on December 28, 2018. Winners of raffle entries from December 28, 2018 12:00 AM to February 14, 2019 11:59 PM shall be drawn on February 15, 2019. All draws will be done via the Randomizer of Petron’s Cards Business Group. The December 28, 2018 raffle draw will start at 2:00 PM and will simultaneously be done in the Petron Iloilo Depot in Brgy. Manzaya, Lapuz, Iloilo City for Visayas raffle entries and in the Petron Davao Terminal in Bo. Pampanga, Sasa, Davao City for Mindanao raffle entries. The February 15, 2019 raffle draw will likewise start at 2:00 PM and will also be simultaneously done in the Petron Mandaue Terminal in Brgy. Looc, Mandaue City for Visayas raffle entries and in the Petron Tagoloan Depot in Tagoloan, San Vicente, Misamis Oriental for Mindanao raffle entries. The 20% tax for prizes exceeding P10,000.00 will be shouldered by Petron Corporation while expenses related to prizes will be shouldered by winners. Prizes can be redeemed until 60 days from receipt of notification. Winners shall be contacted via call, SMS and registered mail. Upon agreed schedule with winners, Prizes can be claimed from the participating Petron service station where the winning raffle entry was issued from. Blocked/ suspended mobile numbers and PVC/ SDC accounts are disqualified from earning raffle entries. Customers can earn any number of entries for every qualifying purchase within the PVC/SDC points earning limit. Winners can only win once. If a name is drawn more than once, he/she will get the prize with the highest value. Non-winning entries in the December Electronic Raffle draw will not be included in the February draw. Employees of Petron Corporation, Petron participating station dealers, and their agencies including relatives up to 2nd degree of consanguinity or affinity are disqualified from joining the promotion. Aside from the winning raffle entries that are drawn, there will be 2 buffer winners to be drawn for Visayas and 2 buffer winners to be drawn for Mindanao during each draw date. In case the winners that are drawn first cannot be contacted or are invalid (e.g. Petron Employee, etc. ), prizes will be awarded to the 1st buffer winners. In case the 1st buffer winners also cannot be contacted or are invalid, then prizes will be awarded to the 2nd buffer winners. How to update my registration on my PVC ? Hi Domingo! 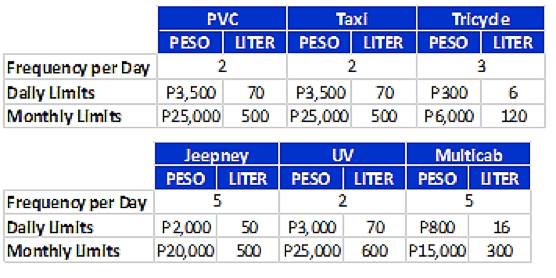 For validation purposes, please send the following details via email (petronvaluecard@petron.com). about the said raffle. The dealer was part of the participating stations. Hi Albert! You would have to re-register with details of your address. Thanks. Hi Edgar! Please email petronvaluecard@petron.com or call #PETRON (#738-766). If you would like to speak with our Customer Relations Group, please message us on FB Messenger with your mobile number. Thank you. Hi,gud evening…just like to ask po paaano ko po malalaman kung may points? Ni register ko na po yung pvc ko.at sabi this pvc # has previously registered . Hi Arnand! To check your points via SMS, please use the following syntax: BAL (space) 16 digit card number then send to 0917-5671111. For related card concerns, please email petronvaluecard@petron.com or call #PETRON (#738-766). If you would like to speak with our Customer Relations Group, please reply with your mobile number. Thank you.